It’s nigh Halloween, and if you haven’t already been spooked off by director Lars Von Trier’s comments at this year’s Cannes Film Festival or by Trier’s excruciatingly visceral last film Antichrist, then perhaps you’ll welcome his latest offering Melancholia, available now for internet download and soon to be in theaters. 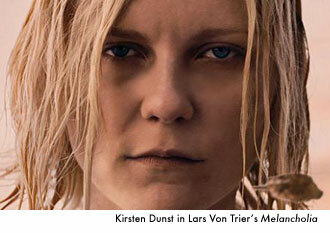 But don’t expect to be scared as his apocalyptic drama centers on another emotion, clinical depression. 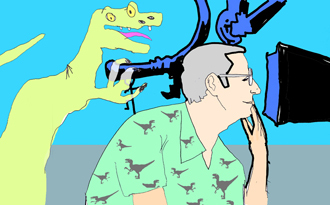 The world is about to end, in one person’s solipsistic view, and in general. Scott Bradley reviews. Terrence Malick is a director known for his elusiveness to the big screen; he’s like a groundhog who only appears to see his shadow if he has a story beautiful enough to tell. Never mind if the story is about a couple on a killing spree, a soldier in the midst of battle, colonialists killing indigenous peoples––there’s always a silver lining of love, seen through an omnipresent eye that distills the good in any "bad" situation. In his latest film, The Tree of Life, he confronts his own bio, going further with the omnipresent––read God––lens, drawing on themes from The Bible’s Genesis story, yet replete with dinosaurs––creation in real time! And 10 years in the future we shall look back fondly on Malick’s juxtaposition of CGI, geology, and high family drama…yes. We <3 Terrence Malick. Due to some technical difficulties, I’m a little late getting up Scott Bradley’s review of The Hurt Locker, the latest film from director Kathryn Bigelow. 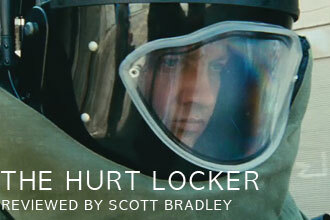 It’s another war movie, but unlike other war movies, The Hurt Locker is, as Bradley says, the first great Iraq war movie, putting it on par with such classics as Kubrick’s Full Metal Jacket and Coppola’s Apocalypse Now. It’s high praise for Bigelow, whose work showed early promise with Near Dark before later finding an unevenness which apexed with Point Break. The Hurt Locker, which was written by war journalist Mark Boal, appears to have shone a light back on her talents.